Just Pick Up a Pencil and Do It. 've met several writers in my lifetime, some successful, some not. What the successful ones have in common is that they write every day. Musicians should take this hint. How many of us practice our instruments every day, but never pick up a pencil and write something? Sure, we say to ourselves, “I wish I were gifted enough to write something beautiful like Composer X,” but that’s because we don’t even try. Just do it. Write something, even something short. This is where writing psalm responses or (ahem) communion antiphons comes in handy. It’s great practice. Sure, you probably won’t use half of what you put down, and sometimes will revise it a dozen times, but it’s important to just try it. You’ll get better, just as you get better at playing the organ, singing, or conducting. It will take time before it is worthy of the liturgy, but it’s important to try. 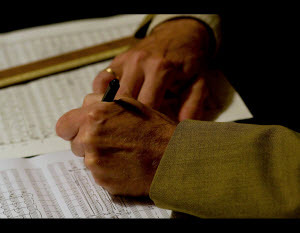 The Church needs better composers, and if all you do is wait for the latest music from (Insert Major Publisher Here), the music will be as stagnant and vacuous as we’ve seen for decades now. Get in the game.